AIR POWERED SUPER LOUD! 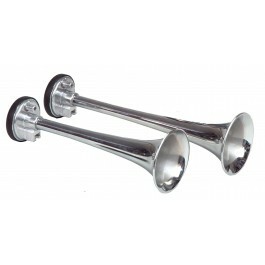 Two (2) bright chrome plated metal trumpets that produce a sound that is sure to be heard. Will dress-up and look great on any motorcycle, with its beautiful chrome trumpet back covers and front weather protection covers. Trumpets come with mounting hardware.